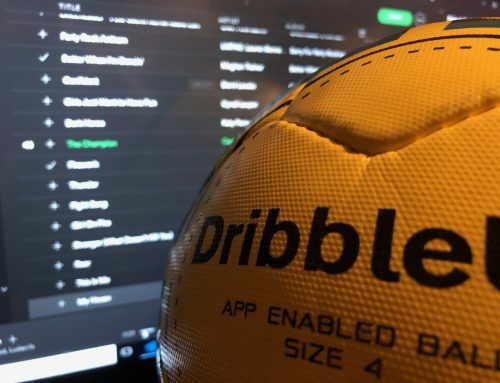 All you need to use the Dribble Up ball is the app on your phone or tablet and the smart ball but after using it for six months we’ve come up with a list of a few accessories that might be nice to have depending on how you’re using the smart ball. As a player, coach, or parent it’s interesting to see the role that technology is playing in sports during games, at practices, and also off the field in planning, training, and analysis. The founders of Dribble Up felt like there were a lot of technology options being created for coaches but not many for players. We think they’ve created something exciting for youth players but like any “main course” it can always be made better with the right “side dishes”. Here are 8 things that we’ve used along with the smart ball, some as a player and some as a coach, that we can recommend. Some of these recommendations to vendors like Amazon include our soccer stripes id so they know the referral came from us. Each DribbleUp ball ships with a stand for your phone that has a detachable base. You can take off the phone stand and screw in a tablet stand for your iPad or Android tablet. If you’re connecting your smart ball app to your television you don’t really need an iPad stand. But if you’re going to be using Dribble Up away from home and you have a tablet it would be nice to have a stand. Players that have used Dribble Up before are fine using it on a smaller screen on a phone but the first time you use the app it’s nice to see it on a bigger screen. So, if you’re a coach and introducing the app and drills to players for the first time it’s nice to have a tablet stand to let them use it on a bigger screen when they’re getting used to it. One thing to keep in mind is that the better the camera and the faster the processor on your tablet the better the app will work. So, if you have an older tablet and a newer phone you’d probably have a better experience using it on your phone. You can always connect your phone to your TV when you first start using the app while you get used to it. The first generation of stands that came with the smart ball from Kickstarter weren’t as sturdy and we broke a few testing out the ball. Since then Dribble Up has switched to phone stands with metal joints and we haven’t had a problem but if you’re looking for a good replacement phone stand we’d had good luck with this telescoping iPhone tripod. You can also find the iPad attachments on Amazon as well. If you’re a soccer family that spends days or weekends out at the soccer complex then chances are you might already have a power bank for extra juice. If you don’t then it’s not a bad idea to pick up a power bank or two to keep in the soccer bag or the car. As I mentioned earlier the app is processor intensive so it will eat into your phone power if you use it a lot in one day. That being said we were out at Scheels Soccer Complex last weekend having a juggle battle with the smart ball and we got in quite a few rounds with our iPhone battery on its last legs. If you’re running team training with an iPad then we’d definitely recommend bringing along a backup or two power banks. We have several free portable power banks we picked up from various United Soccer Coaches events but you can get one on Amazon for between $10-15 like this portable power supply. We actually ordered our HDMI mirroring cable the same day we ordered our first Dribble Up ball because we were excited to use it on the big screen. Unfortunately, the first cable that came in didn’t work for us so we had to order a different one. On newer smart TVs you don’t even need a cord but our TV is older so we needed a cable to show the app on the television. This is a definite must have Dribble Up accessory because putting it on the big screen makes it a more interactive experience. When we do Dribble Up in our living room all the kids get involved and sometimes tag team the playlists. It’s perfect for a rainy or snowy day when training is cancelled and you can easily spend an hour with the family going through playlists. This is the HDMI Mirroring Cable that works for us. You can see in the photo we also bought this Lightning to HDMI adapter which did the trick as well. But that adapter cost about three times as much and doesn’t come with an HDMI cable so the HDMI mirroring cable is a better buy for your money in our experience. We’re into gadgets so we bought the very first Chromecast that came out 5 years ago. It’s pretty old and doesn’t work as well as the newer generation ones but we’ve gotten some good use out it. A new Chromecast isn’t super expensive, about $35, so we’re due for a new one. We haven’t tried it but if you have an Android device you can cast the app onto your TV with Chromecast. Some of the newer TVs actually have Chromecast built in but if yours is older like ours then you can display the Dribble Up app with a Chromecast dongle . Dribble Up is good at tracking your foot skills but it’s also interesting to see how much physical activity you get out of the drills. You’ll definitely be out of breath after going through a playlist but wearing a tracker will tell you how much movement you get when going through the drills. If you don’t already have one of these I wouldn’t go out and buy one just for using with Dribble Up. But if you already have a Fitbit or a Zepp Soccer tracker it’s interesting to wear it while you’re going through a skills playlist to see how much activity you get from it. Comparing one session to the next after it’s over would give you an idea of how much work you put it based on past workouts. This is a non-tech accessory but meant to protect your tech. We’re all used to carrying a soccer bag with all our gear but once you add technology into a bag full of soccer stuff you worry about potential damage. If you’re a coach and carrying around an iPad or two and iPad stands it’s not a bad idea to have a separate protective case or sleeve to store them. There’s a pretty wide range of iPad bags based on your preference of cost/features but it’s not a bad idea to pick up one of them. If you already have a laptop bag they work pretty well for sliding in power bank, iPads, stands and all the other accessories but of course then you have to carry that bag and your coaching gear as well. Projecting the app onto a screen or a wall is a neat thing to do if you have a big group at an event. Using an iPad is fun for an individual player but if you want a group to be able to see the drill as they’re going through it that doesn’t work as well. Obviously, the downside of a projector compared to putting it on a TV screen is that you have to worry about the lighting in the room and being able to see the projection. The projector that we use is a Brookstone HDMI Pocket Projector that was originally $200 but we found on sale for $100 since they were ending that line. This mini projector is portable and works really well but it’s also pretty pricey – Miror Mini Projector. This isn’t a physical accessory but it is nice to have a place to store the videos you make while doing Dribble Up drills. 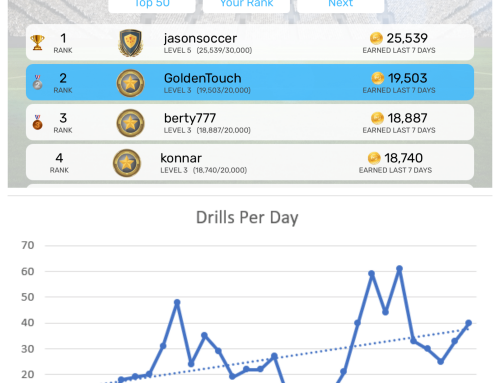 The Dribble Up app keeps a history of your drills so you can keep track of how you’ve scored over time. It’s also neat to store videos of your dribble up sessions that you can go back and look at. For example, you could capture the video of a playlist at the start of a season and also at the end of the season and see the difference. We have a variety of ways that we store the videos from Dribble Up. 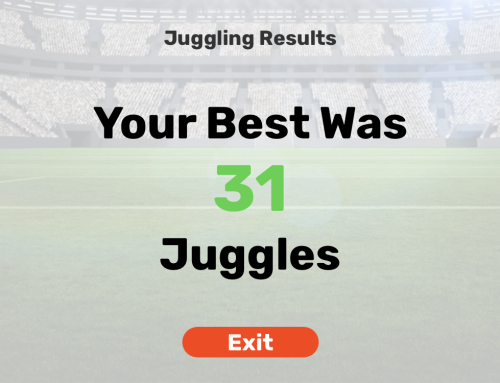 You can store videos for free in Google Drive, we also use Google Drive to store game videos so we’ve uploaded some of our juggle off videos from the smart ball app into Google Drive as well. We use enough storage space with our game videos that we have to pay for the service but it’s been the cheapest option we’ve found. Dropbox is another option since it makes it easy to move the videos from your phone into the cloud for storage. If you’re interested in sharing your videos the free way to do it is to upload them to YouTube. If you want a little more control over who can see them you can also use Vimeo, it gives you more control but it’s not a free service. Hopefully some of these suggestions will work out for you. 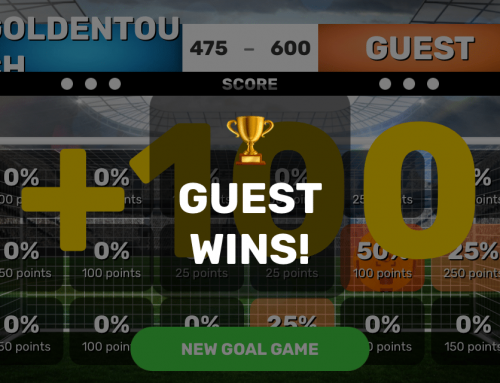 If we had to suggest one we’d say go for the tech that lets you hook the smart ball app up to your television, whether that’s an HDMI Mirroring Cable or a Chromecast. We’ve had a lot of fun putting Dribble Up on the TV and getting everyone involved.